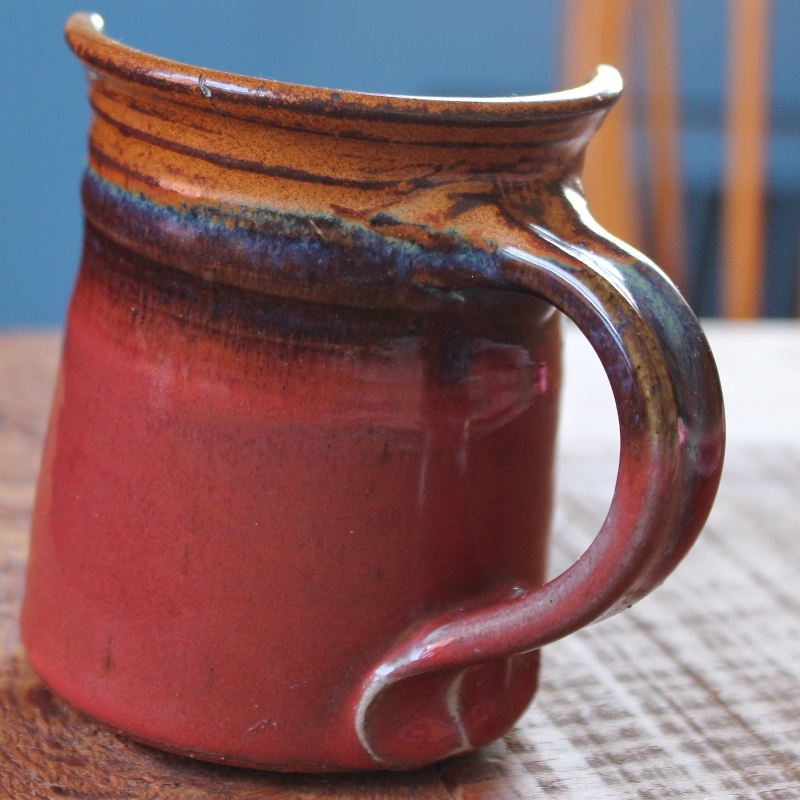 My favorite souvenir to buy while on a trip is a hand-thrown pottery mug. I have several and LOVE using them. My dad even brought me one back from Scotland last year. I love the feel of them in my hands, the different signatures on the bottom, the memories of trips taken and enjoyed as I’m sipping my tea. I had never broken one until last Friday morning. The night before had been a rough one (Mark is sick and nursing a TON) and so I was staying in bed as long as possible while the kids were up with Nik. All of a sudden I heard a strange noise, followed by Ellie saying, “Mark! Mark! Be careful! Put on your shoes!” I called out for Ellie to come and tell me why Mark needed to wear shoes at 6:45 in the morning and heard the sad news. I’d enjoyed a cup of tea the night before and had neglected to move it to the kitchen before falling into bed. 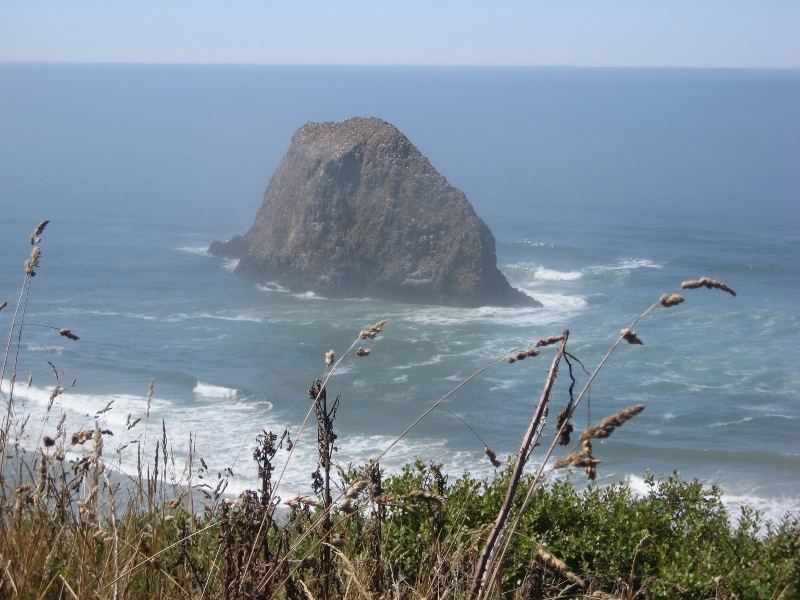 The mug they knocked off the side table was one that I had found in Cannon Beach, Oregon* when Nik and I went there in 2009. I somehow managed to only blog a couple of silly pictures of that trip so here are a couple beautiful ones, only five years late! I’m going to replace it! No one is ever going to touch my mugs again. Upon a bit more reflection, and after, tragically, two days later, managing to drop my Montana 2013 mug in the sink and break that too, I came to my senses. 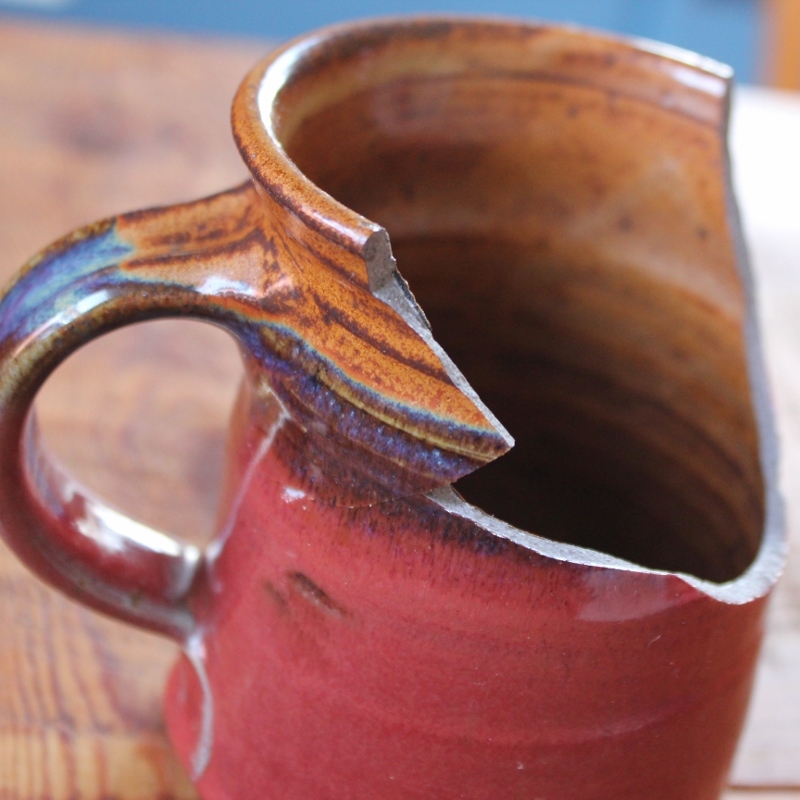 Clearly, it’s not just other people who are going to break “my” mugs. What’s the point of having something if not to be used and loved? It’s fairly antithetical to what Nik and I believe to acquire stuff just to have it. When our kids do this (i.e. when they are accumulating toys just to hold them and to keep others from playing with them), we call it “being a dragon”. ** We don’t want to be a dragon who finds joys in counting and exulting over our stuff. We want it to be useful or beautiful or both, and in any case, used. And should I replace them? I don’t know. I loved, LOVED that red mug. I know this probably sounds weird but I really enjoyed my tea the most when drinking it from that mug. I just searched the web for the potter who made it (having taken a picture of the name on the bottom of the mug before throwing it out so I wouldn’t forget) and she has retired. I can’t replace it. More importantly, I think, I can’t relive that trip again. Do I really need to replace the souvenir? Probably not but I really do want to. 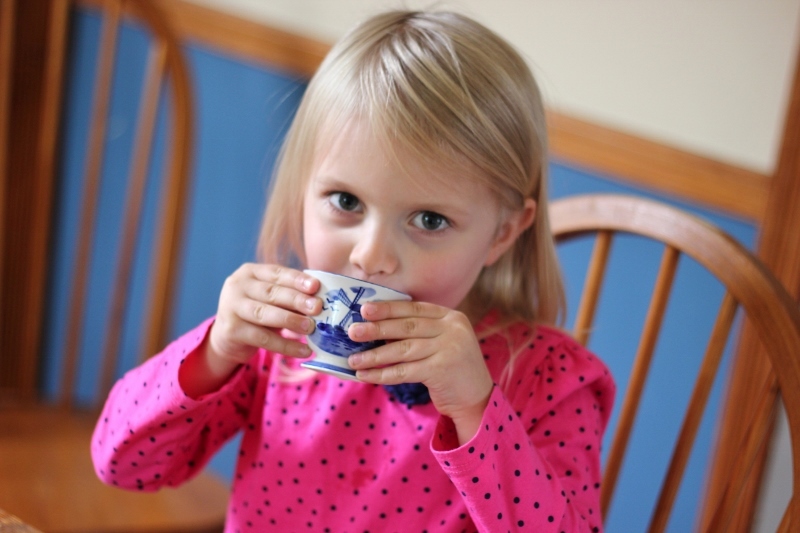 sipping her “tea” (mostly milk) from her great-grandmother’s mug, because I know my Granny would have loved knowing that her great-granddaughter was using her tea cup and because, what’s the point of it just gathering dust? *Please, all you East Coasters, repeat after me – “Or-eh-gun” (NOT “Or-e-gone”). **I take no credit for the “dragon” idea. I read it in a parenting book, most of it not particularly useful but I did like that idea! 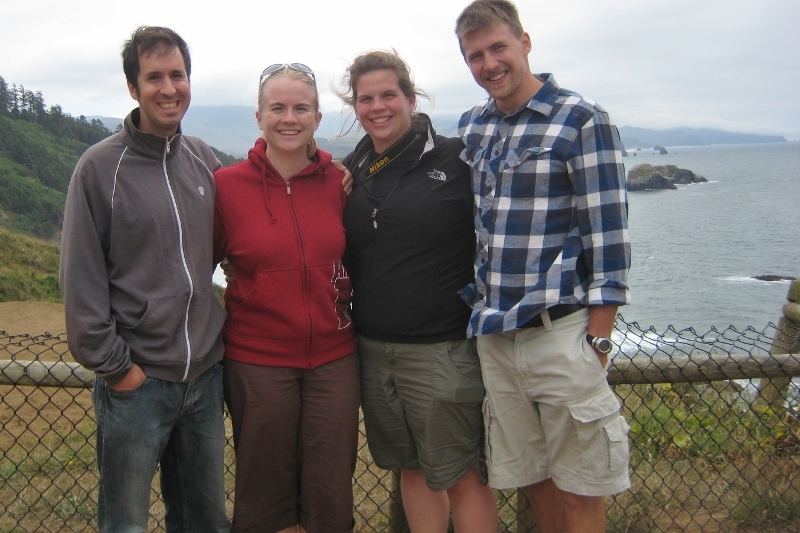 This entry was posted in parenting, reflecting, travel. Bookmark the permalink.